Old Benjamin was in his 76th year when he died. He used to fetch sheep from farms all over the district and drive them by road from Rushden to Smithfield Market. He would have as many as 500 or 600 in his flock and with the aid of two trained dogs would do the whole journey in 3 days returning home by the stage coach. 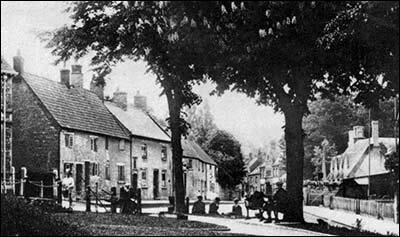 He lived opposite the old Coach & Horses at Rushden. The dogs would not wait for Benjamin. No sooner did they see the last sheep penned at Smithfield Market they set off straight home & would reach Rushden before the coach arrived. on the right. Benjamin lived in one of them. From a postcard c1902.